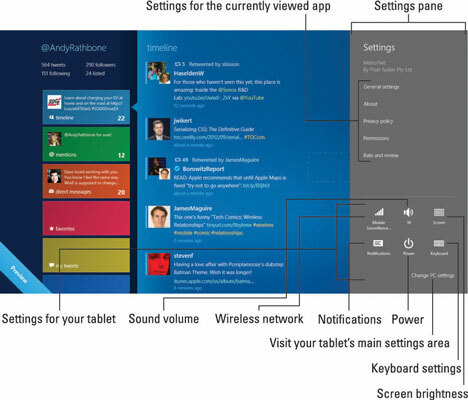 The Charms bar’s Settings icon on your Windows 8 tablet lets you tweak the settings of the app you’re viewing. It also serves as a gateway for tweaking many of your tablet’s most common settings. To change your currently viewed app’s settings, summon the Charms bar by sliding your finger in from the screen’s right edge. When the Charms bar appears, tap the Settings icon. The Settings pane appears. Volume: Tap here to fetch a sliding volume control. Slide the bar up to increase the sound; slide it down to lower it. Notifications: Designed for people tired of seeing notifications about Instant Messages and other tripe popping up on their Start screen, this button lets you turn them off for one, three, or eight hours so you can get some work done. Power: Tap here to Sleep, Shut down, or Restart your tablet. Keyboard: This lets you switch between different keyboards or languages, depending on how your tablet’s manufacturer set it up.